Welcome to Penzion Martin *** Janské Lázně. 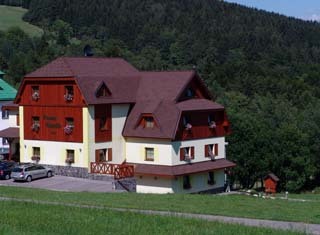 Penzion Martin *** provides accommodation in beautiful scenery of the Giant Mountains at the root of Černá hora - Janské Lázně! Penzion Martin *** offers accommodation in Krkonoše - the Giant Mountains not far (cca 400m) from the centre of favourite spa Janské Lázně and just 20 metres from the nearest ski - lifts. Accommodation is possible all the year round! We accommodate You in nicely furnished rooms. Total capacity of Pension Martin *** is 50 beds. Available are 2, 3 and 4 beds rooms, extrabed is possible. 4-beds rooms can be booked as 4-5 beds with kitchenette (the 5. bed is in the kitchenette). Kitchenette is equipped with microwave and electric kettle, it´s not intended for cooking. Buffet breakfast is served in restaurant of Pension Martin ***. Accommodated people can spend 30minutes a day in relax pool with back flow. There are many well marked tourist routes and trails for cycling in area of Janské Lázně, Krkonoše, the Giant Mountains. 200m from Penzion Martin *** there is mountain stream with waterfalls. There are other possibilities of sports as well - rope centre, minigolf, spa pool, football, ski resort, etc. New 8-seat cable way called "Černohorský express" will carry You to the top of Černá hora mountain. Ski resort SKIARENA Janské Lázně gained 5* cathegoryand reached 2nd place among all other ski resorts of the Czech republic. For more information You can call Penzion Martin *** accommodation Janské Lázně, Krkonoše : (+420) 731 495 600 or send e-mail to: info@penzionmartin.cz. Welcome to Janské Lázně, the Giant Mountains, Krkonoše ! Enjoy Your holiday in Penzion Martin *** Janské Lázně !